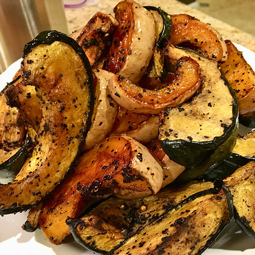 Smoked Squash - A recipe from Savor California, the online showcase for extraordinary gourmet foods and beverages from California. Heat smoker. Use pecan wood and a little apple juice in the water pan. Cut up the squash into nice size chunks. Put them into a bowl and mixed them with a little olive oil. Sprinkle Steak Mojo all over them. Make 2 layers of squash in the smoker. One layer per rack. Coat the whole garlic with some olive oil and Porcini Truffle Tango. Wrap in a bit of tin foil. Smoke the squash and garlic at 220 degrees for 3 hours. Finish in a roasting pan in a 375-degree oven for about 20 minutes.